Watches Frederique Constant are luxury wristwatches, made for men and women. The making of these chronographs enter into itselves the deepest creative process, inspired development, the highest attention to details and effective expansion. But let's begin with roots of this famous watch manufacture. History of Frederique Constant takes the beginning in 1904, when Constant founded lithography company "Lithography" on production of metal plates. On such plates were printed images, and the same technology used that times for production of watch dials for developing manufacture Friesche Klokken. But soon the company sank into oblivion till 1988, when marrieds Piter Stas (economist) and Alleta Bax (lawyer) decided to recover family business. As the name of new manufacture were taken names of progenitors: from the side of Alleta was taken the name of her great grand-mother Frederique Schreiner, 1881-1969), and from the side of Piter the name of his grat grand-father Constant (Constant Stas, 1880-1967), the founder of lithography company. In 1988 Piter Stas and his wife presented six prototypes mechanical watches models, which were developed by them. The success of the brand was stipulated by two factors: well-known design (guilloched central oval on round dial, hands of Breguet style and big Arabic numerals), and also technology Heart Beat, which let to watch for balance work through the window in the dial. What is a technology of Heart Beat? Now I'll try to explain why this movement became the symbol and pride of the company. Heart Beat is one of the visit cards of watches Frederique Constant. Through special window in the dial you can watch the work of movement. At the biginning of 90-s mechanical watches looked like quartz, and manufacture Frederique Constant visually marked the difference between mechanical and quartz watches. In 2004 during celebration of 10 anniversary of introduction Heart Beat technology, Piter Stas presented fers own caliber manufacture FC-910. Caliber was the result of painstaking work of Frederique Constant masters with leading Swiss schools of horology: Ecole d'Ingenieurs de Geneve, Ecole d'Horlogerie de Geneve and Horloge Vakschool Zadkine. With the help of enlarged balancer grew the accuracy of work and entertainment. In 1999 Frederique Constant added Heart Beat with calendar functions (Heart Beat Day-Date), showing day of the week and date, and "Perpetual Calendar functions. Amazing collections of wristwatches from Piter Stas and his wife will not be ignored by even the most skeptical person. There are ten lines of unique chronographs (Art Deco, Carree, Classics, Index/Healey/Runabout, Junior, Maxime, Persuasion, Slim Line, Ladies Collection, Heart Beat Manufacture), but I suggest to stop on the most, as I think, beautiful creations of successful manufacture Frederique Constant. Let's see two collections which became the most recognizable among creations produced by this brand. Line Ladies Collection will like ladies who prefer elegant accessories. The fans of old cinema will agree that if Elizabeth Taylor - the actress, who gets the seventh place of greatest stars of the cinema range was alive, she with great pleasure wore watches from Ladies Colection on her fragile wrist, because chronometers of this collection has faminine design, rich finishing and flawless accuracy of movement. Company Frederique Constant produces perfect watches for men as well. Collection Heart Beat Manufacture is made in classic style, that is why such watches will suit in any situation. Especially men will like that technical filling of these models is rather complicated - for example skillfully made tourbillons or such complication as Moon calendar. But let us make some retreat from Swiss watches Frederique Constant and talk about charity of manufacture. In 2011 there was charity auction OnlyWatch, which was in Monte-Carlo under patronage of His Serene Highness Prince Albert II. Money, which was raised on this auction, was given on development in area of muscular dystrophy of Duchenne. In this auction participated and watch company Frederique Constant. It presented its chronographs called Frederique Constant Family Set of Four, which were sold for 22.000 euro. Frederique Constant Family Set of Four presents unique set from four watches for every member of the family. On every piece there is special engraving «Family Set Unique Piece», which is situated on the back case. Set is in perfect wooden box, which is made by order. I think that companies which participate in charity auctions, worth of great respect. Support of sick people is a great blessing! In selling of wristwatches Frederique Constant, the part of money transfers to International charity children fund "Child's heart" for treatment of children with hard diseases. Well, manufacture Frederique Constant can be easily called not just successful but also generous, especially for children, because they are our future! Of course, such popular and successful manufacture like Frederique Constant, has a lot of merits and couldn't stay without awards. Frederique Constant won prize Centurion Design Award almost for two years. Prizewinner of this prize were popular chronographs Frederique Constant Vanilla Love Heart Beat, which were choosen number one of the general range of models anopther strongest companies. President of Frederique Constant North America Ralf Simmons said: "Being the second consecutive year awarded with Centurion Design Awards is a great honor for us. I would like to thank for organizing this event Howard Huben and all retailers, following the vote we won". Prize Centurion Design Awards was handed in eleven categories. Among them were not just watches but also jeweleries. The second prize in jewelery category got manufacture Frederique Constant. The prize won model Frederique Constant Lady Automatic Double Heartbeat, which is decorated with 109 brilliants. Also in 2011 in museum D’horlogerie du Locle – Chateau des Monts were presewnted 18 watches, which participated in International competition of chronometry Concours International de Chronométrie. In this competition participated company Frederique Constant, which presented its watches Frederique Constant Tourbillon Manufacture Silicium. I think that all chronographs of company are luxury! They absolutely worth of such high prize! Except charity, manufacture Frederique Constant is a sponsor of different interesting sports. Brend became official chronometrist of retro-rally La Carrera Panamericana, which takes place since 1950. This raly is one of the famous races of retro-automobiles. Partnership with auto-rally La Carrera Panamericana became the significant event for watch company Frederique Constant, which act as rally sponsor not the first time. In honor of 24-th rally La Carrera Panamericana manufacture produced limited wristwatches in 1888 pieces. Logo of auto-rally is on the dial of chronometer at the position of "3 hours". Bu I wouldn't call this watches a rarity! Well, if only on presentation of Frederique Constant, limited edition is when on every citizen of Switzerland has one piece! How do you think, what close manufacturer of luxury wristwatches and retro-rally? You don't know, and I know. 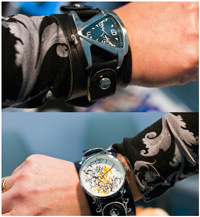 As riders and watchmakers brings total passion for their hobbies. It is appeared that Frederique Constant doesn't limit by co-operation with organizators of vintage races. Prolific manufacture Frederique Constant also co-operates with organizators of yachtsmen meeting Helice Classique. Swiss watch house turned to idea of respectable retro and produced for fans of class luxury chronometers and perfect unique boats - the same name traditional chronograph Runabout. Runabout is class of light motor boats, which became to produce at the beginning of 20 century, and its prime was on periods between World Wars. If I could explain you the connection between races, yachts and watches, to understand what general between watch company and Cuban cigar brand Cohiba is not easy. Let's deal. Brand Frederique Constant signed agreement about co-operation with the most popular cigar brand Cohiba. In honor of this legend partnership was produced exlusive set, made special for American market and includes chronometer, humidor with cigars. Perfect double box with separations for cigars and watch in the form of Toro (rectangular case) was produced in limited edition of 376 pieces and presented in New-York. It is rather value collection, in which presents real Cuban cigars with wich connected interesting facts. These cigars were made special for Fidel Castro, who is great commander of Freedom Island. The inventor of these cigars is Eduardo Rivera, worked as torsedor (a person who rolls cigars) on manufacture La Corona in Havana. Once, Eduardo treated his friend, who was bodyguard of Fidel Castro. That treated Fidel Castro. Great governor was amazed and Eduardo's fate changed. Soon, cigars Cohiba turned into source of revenue for the Cuban budget. For last 15 years company Frederique Constant showed record selling, and it says that brand uses great success. In this regard increases the number of famous persons, representing the Swiss brand. Many famous persons are happy owners of wristwatches Frederique Constant. Stars with interest included into charity company, which organized Frederique Constant. Thus, Frederique Constant and super popular actress Eva Longoria gathered for holding annual charity celebration in Paris called Par Coeur Gala. Association Par Coeur constantly searches for opportunities to attract attention of financially responsible charity agencies, which help many families and children all over the world. And also manufacture Frederique Constant co-operates with beautiful Chinese film-star Shu Qi. Incomparable Shu Qi is an official face of the company Frederique Constant in Great China since 2008. Company and Shu Qi held charity action in cardiology department of Pekinese children hospital. The visited little patients, and Miss Shu Qi presented to kids as joyful and caress “Queen of kids”, who please them with focuses, games and presents. Frederique Constant actively participates in decision of ecological problems with queen of beauty, participating in work of protection of nature and the environment Nicole Faria. Manufacture Frederique Constant went on rare and unique step on modern watch market called Nicole Faria (winner of the title Miss India and Miss Earth 2010, Pantaloons Femina Miss India Earth 2010), official face of the brand. She was honored to support initial steps of company Frederique Constant in India. Frederique Constant doesn't stop and constantly fills its collections with new unique masterpieces. Thus, on International exhibition Baselworld 2012 company presented the novelty – wristwatch Index Moon Timer Automatic. Chronometer presents elegant round classical one button chronograph, modified with function of Moon phases. Really amazing novelty! Also in 2012 filled collection Frederique Constant Double Heart Beat with new model Black Beauty. This wristwatch will please elegant and refined women. Luxury women chronograph is made in round case with perfect pearl dial of black color decorated with brilliants. Model differ with patented design of the dial with hole in the form of two hearts, through which the thinnest work of the movement is seen. Accurate hand assembly of watch Black Beauty shows high level of its making. Most of all I am amazed by price policy of company Frederique Constant. Ideal ration of price and quality of models let the company to attract on its side huge number of brand fans. Amazing mechanical watches from steel costs not expensive then 750 euro! Is this not a fairy-tale?! And prices on models from gold don't high more then 3000 euro. In the whole, I agree with brand policy. Summarizing all the above, I can claim with comfidence that brand Frederique Constant is unique watch manufacture. Undoubtedly, choosing watches of Swiss company Frederique Constant, you choose style, brightness and nobility!